The Polonez is Europe’s newest rocket artillery system. On October 30 the defense minister of Belarus was welcomed in Beijing for a meeting with his Chinese counterpart. According to the Ministry of National Defense (MND) the two officials discussed the growing alliance between their countries, an alliance hinged on Chinese investments and collaboration in Belarus’ local industry. China is willing to work with Belarus to fully implement the important consensus reached by the heads of state of the two countries, taking advantage of the “Belt and Road” construction, upgrade the level of cooperation between the two militaries to make new contributions to the development of the China-Belarus comprehensive strategic partnership. Belarus is the first European country to become a customer of Chinese military exports in the post-Cold War era. The People’s Republic of China did have a robust trade east of the Iron Curtain and it cultivated isolationist Albania as an ideological client for decades. But as its bilateral relations across the continent normalized in the 1990s, there wasn’t any strong demand anywhere in Europe for Chinese arms. The only exception were the former Yugoslavia’s successor states such as Bosnia and Herzegovina. Untold amounts of Chinese small arms and missiles smuggled by clandestine networks were delivered to the country during its civil war. Since 2011, however, the Lukashenko regime sought to enter China’s orbit and reap tangible economic rewards. China reciprocated with regular joint exercises, the latest being held in July 2017. Belarus, on the other hand, managed to buy token amounts of equipment from China for modernizing its decrepit armed forces. There’s now irrefutable evidence Belarusian diplomacy has reached a point where reproducing Chinese weapon systems is allowed. The impressive Polonez long-range multiple rocket artillery platform, for example, uses borrowed technology that gives it a range on par with short-range ballistic missiles. There’s a lesson here. When it comes to joint ventures between their respective military-industrial complexes, Belarus and China have almost limitless possibilities. 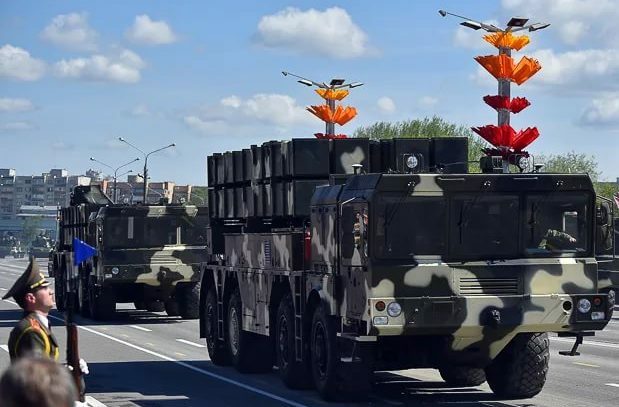 Belarus’ state-owned science and engineering firms, along with a collection of manufacturers, can build radar complexes, fire control systems, detection and communications equipment. Overhauling main battle tanks, assembling armored vehicles and complete mobile SAMs are within their competencies as well. The bottom line is Belarus is a more sensible partner for sharing Chinese technology compared to struggling allies like North Korea and Pakistan. Meanwhile, China’s conglomerates can fill whatever gaps arise, from aircraft to drones to small arms, in Belarus’ technology base. As a perfect totalitarian regime, Chinese expertise with interception and surveillance must be enticing for Belarus’ dreaded security apparatus. A few Chinese firms did participate in Belarus’ largest arms show this year, MILEX 2017, and their presence should grow in the coming years. Parsing through the Beijing-Minsk axis might still be a headache at the moment but there’s enough evidence to show its sinews are getting tighter. It’s a bond that contrasts Belarus’ own uncomfortable partnership with Russia.